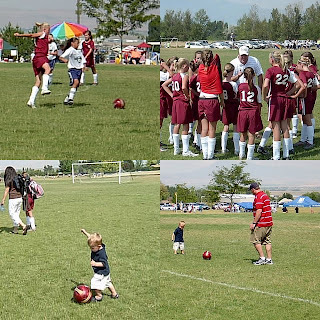 We reached our final destination Wednesday evening (my sister's, Katie, house in Logan, Utah) just in time to watch my niece play in a soccer tournament. 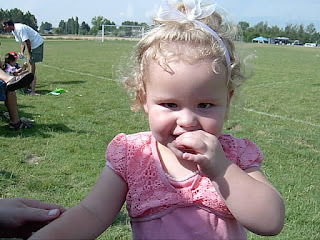 We have been watching her play soccer since she was just a little thing so it's fun to be able to see her in action. Her dad has been her coach all along the way and that makes it twice as fun to watch. Alex in action; Chris "coaching" (Alex is #20); Owen dribbling the soccer ball; Kevin teaching Owen a thing or two about soccer. After the game Alex (my soccer playing niece) was kind enough to babysit her sisters and Owen so the grown-ups could go out to dinner. We went to a great restaurant (one of our favorite local joints in Logan...Firehouse) for dinner and had an indulging time! (; We spent the night at Katie's and went to another soccer game on Thursday morning, which ended in a victory for Alex's team, and after lunch we were on our way home. Gabby at the Thursday morning soccer game. We had such an enjoyable time this week. It was so fun to be able to see so much family in such a small amount of time. 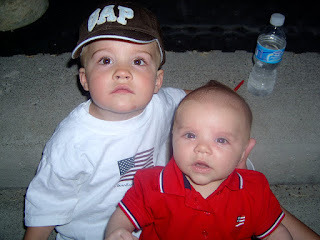 And, Owen and Wesley were able to see everyone of their 18 cousins! 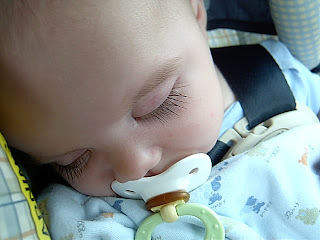 Wesley during the drive home (look at those lashes). After spending two days with Kevin's family we headed "down the block" to spend some time with my sister Melissa and her family. We stayed with them Tuesday night and Wednesday afternoon we drove to Thanksgiving Point to enjoy their gardens and Noah's Ark. 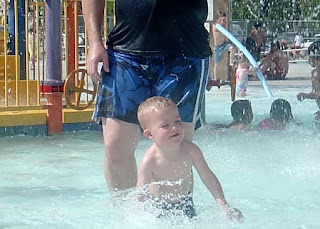 Owen loved running around with his cousins in the water (two of his favorite things). But, once the thunder and lighting showed up we were out of there and on our way to Logan, Utah. 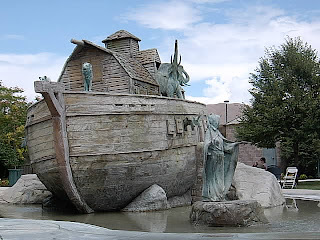 Noah's Ark at Thanksgiving Point. It was pretty impressive and the animals would randomly spray water on the kids. 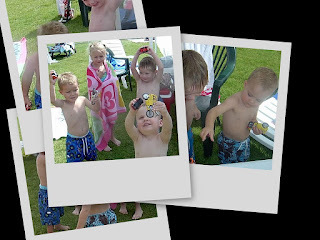 Owen playing with his cousins (Payson, Keagen, and Jamis). 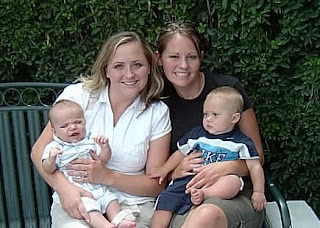 Becky holding Wesley and Melissa holding Micah. 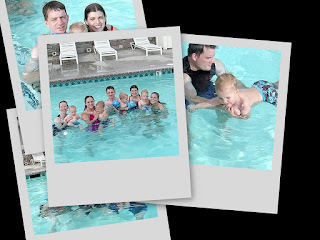 After a hot afternoon at the zoo we were all excited to go back to Sam & Lisa's apartment complex for some swimming. It was the perfect way to cool down. After swimming we just spent the evening recovering from the days activities. Owen and Brian got their second wind just in time for bed. They sure had a good time playing together. Brian and Owen playing in the pack 'n play (meant for Simon and Wesley). 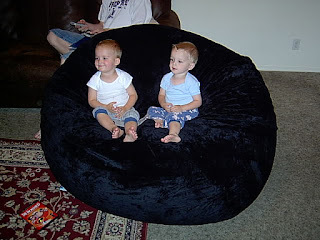 Owen and Brian winding down with a movie. Tuesday we played at the Kangaroo Zoo (an indoor play land of inflatable toys) in Pleasant Grove, UT. You would think this would be a two-year olds heaven, but the only thing Owen loved playing with was the toy cars. We think he might be clostraphobic. Later that evening we enjoyed a nice picnic with some of Kevin's aunts and an uncle. 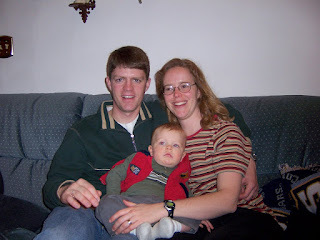 It was nice to be able to spend time with Kevin's family (visits like this are few and far between). One benefit to having a husband in school is that you still get a summer break! We took complete advantage of that this week and spent an action-packed 5 days in Utah. 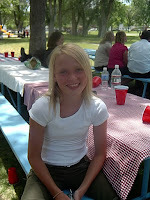 We drove to Pleasant Grove, Utah Sunday afternoon to spend some time with Kevin's siblings. Aaron (his older brother) and his family were visiting from Colorado, Rosanne (his sister) drove up from Las Vegas and we all met at Sam's place (his younger brother). It was great to get all the cousins together for the first time since Simon and Wesley were added to the family. We were just a little sad that the rest of the family wasn't able to be there (we missed you Fred, Carolyn, Staci, and Laura). 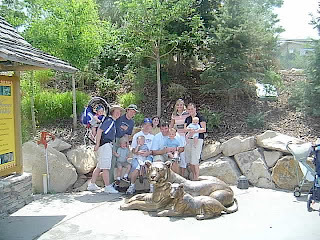 The first item on the agenda was the Hogle Zoo in SLC, UT. We spent most of the afternoon at the zoo enjoying the animals and the bird show. The Ward clan. 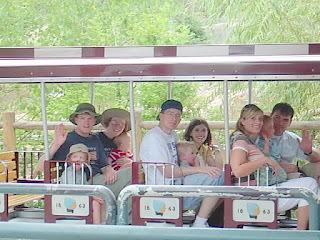 Sarah carrying Simon, Aaron, Kimball, Sam holding Brian, Lisa, Kevin holding Owen, Rosanne, Becky holding Wesley. Of course we had to take the train ride (all the boys LOVE trains). Wesley and I stayed behind. 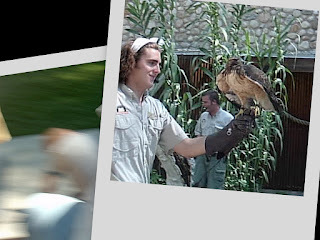 Hogle Zoo puts on a pretty good bird show--they have birds fly into and around the outdoor theatre. Owen and I had to leave a little early (he was scaring all the birds with his antsy-ness). Kevin tried to take a few shots of the hawks but ended up getting a picture of the ground when the hawk flew so low he actually had to duck and still got hit by it's wing. Owen and Wesley at the zoo. 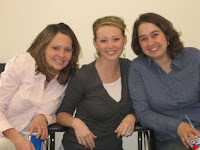 Happy Birthday Melissa! We are so excited that we actually get to see you on your birthday. We hope that you have a great time celebrating the big 2-7! I bet your boys have something special planned for their favorite girl. I am so lucky to have such a great little sister to look up to! Happy Birthday Alex! What a beautiful girl you have become. It's hard to believe I have a niece turning 12, but at the same time it's not too hard to believe because you have always been so mature and helpful. We hope you have a great day today. Play hard! We love ya! Wow Gabs! It's hard to believe it has been two years. 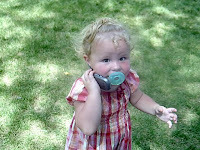 You have grown up to be such a character...and cute as a button! We hope you have a spectacular birthday celebration. It's hard to think your sisters could dote on you anymore than they already do, but I am sure they will give it a good go on your big day. Happy Birthday! Yesterday day we celebrated Owen's birthday with my family. 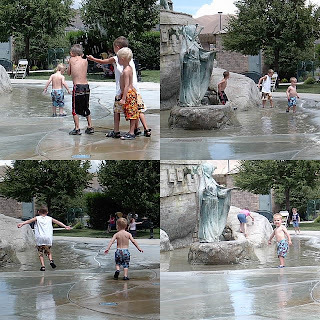 We spent the day at Ross Park Aquatic Center here in Pocatello. We had a great turn out and we couldn't have picked a hotter day to spend in the water. We celebrated with cupcakes and each cousin was given a Hot Wheels car (although I ended up finding most of them in my bag when I got home...I hope that wasn't Owen's doing). Owen loved spending the day with some of his favorites (Carter, Ogden, water, and cars)! 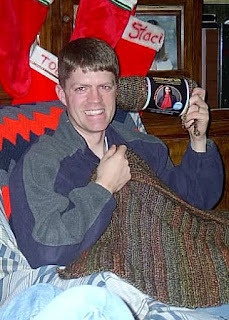 He was also given some great gifts which we spent most of the evening playing with and some even ended up sleeping with him that night. Thanks to everyone for making this day so special for our little "O". Owen couldn't get enough of the new cars and motorcycle he got. 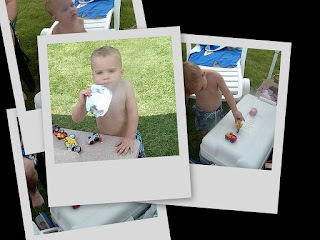 You would think that the pool/water would have his full attention, but I guess he like cars more. 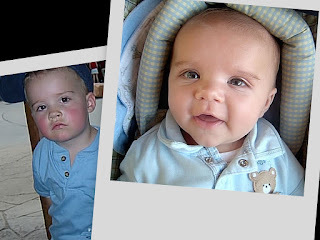 Owen loves his cousins Carter and Ogden. He was so happy when they showed up! Yesterday was Owen's 2nd birthday! 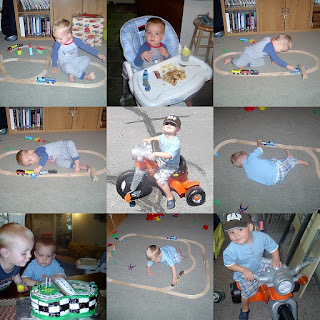 We did a Cars theme since that is his favorite movie and toy. It was a day packed full of new toys and favorite foods. We got him a new tricycle and a train set. He loves them both! Kevin also really enjoyed playing with the train set and changing the track style all day...for Owen's enjoyment of course. Owen with his new train set; He had to eat his pancake breakfast with this new trains; He loves pushing the trains through the tunnel; more trains; Owen on his new tricycle; more trains; letting his friend have a turn blowing out the candles; more trains; Owen on his tricycle. And, the cake! I need to remember to get this part done the night before. I spent a good portion of the day baking and decorating this beast of a cake. I finished it just in time to cut into it! 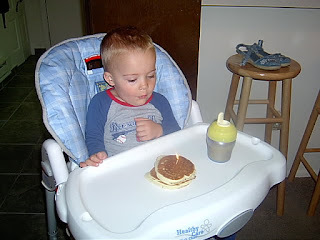 But, Owen did think it was great...so that was worth all the work (and frosting). 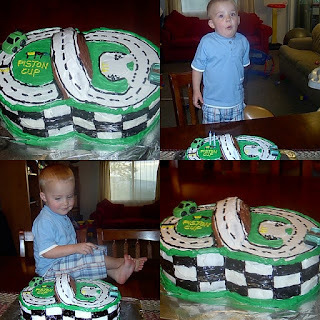 Owen's Cars cake; Owen getting ready to blow out the candles (real ones this time); Owen admiring his cake; THE cake. 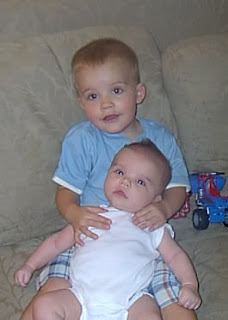 Our birthday boy even wanted to hold his baby brother on his birthday (we always get excited when Owen actually asks to hold Wes), but before we could get a decent picture Owen started pushing him off saying "I don't want it!" 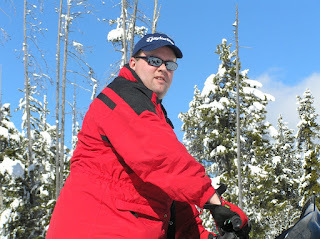 Today Aaron (my brother-in-law) turns 30! Happy Birthday Aaron! We hope you have a spectacular day and we look forward to seeing you and your family later this month! Happy Birthday Chris! I think Katie made a typo on the family calendar because it says you are turning 36 today (that is darn near 40 years old)! Anyway, we hope you have a spectacular day. I am sure all those girls will take extra good care of you today. When we found out that Emily, Brandon, and Chase (Brandon's brother) were heading our way to go swimming we couldn't help but join them. It was beautiful weather and we were able to have even more fun with company. What a great way to spend your afternoon! Today was Kevin's last day of his clinical at Portneuf Regional Medical Center, and he only had to work a half day. So, we decided to celebrate his first "real" day of summer by going swimming. 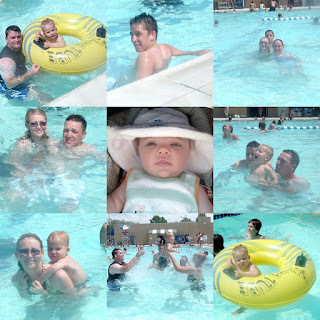 Going to the aquatic center with a toddler and a baby isn't quite aas exciting as with just a toddler...but, we still managed to stay cool and have some fun in the sun at the same time. 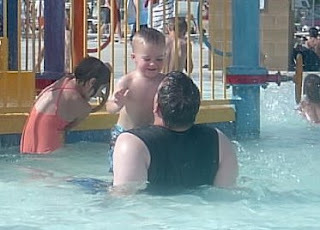 Wes and I preferred the Lazy River, while Owen and Kev quite enjoyed the kid pool. Owen and Kevin playing in the water. I am not sure who was having more fun...Owen or Kevin. 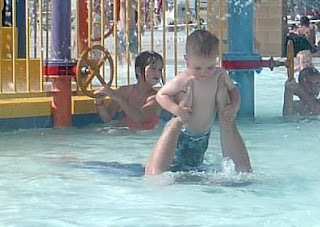 Owen sure enjoyed the water more this year. 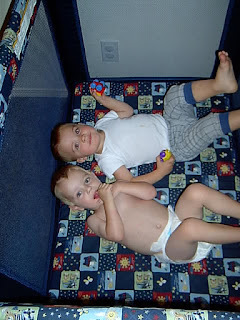 This afternoon I put Wesley on Owen's little bed while I getting Owen ready to go swimming. 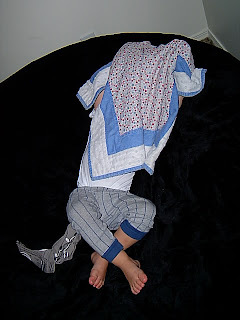 Next thing I knew Wesley was fast asleep having a fantastic dream (he had the biggest grin on his face). 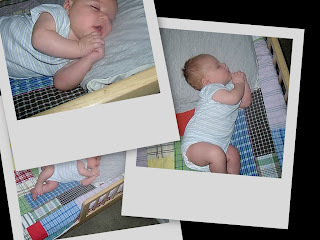 Doesn't he look so comfortable? What a cutie. Well, another holiday has come and gone. But, we did get a lot of fun in celebrating the last few days. Tuesday night a few of us (my parents, Ben & Kaylin, and my little family) decided to go camping at Wolverine (about an hour drive from Poky). Justin, Amber, and their family came and enjoyed the camp fire then drove back home to sleep. 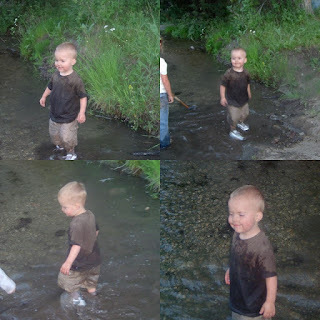 After we had been there about 10 minutes Owen was completely covered in dirt and decided he wanted to cool off and play in the spring that ran through the campsite. It didn't take long for Owen and his cousins to become little mud buddies. What a mess! But, they had a good time...and that's what matters. Right!? Everyone was pleased to discover that I had actually spent the entire night in the tent. I was a little surprised myself. I took comfort in knowing Ben's dog was close by and that my dad's snoring would keep any animals away that night. In the morning Ben made us a great breakfast (pancakes, bacon, hash browns, and eggs) and then we loaded up and headed home to clean up. 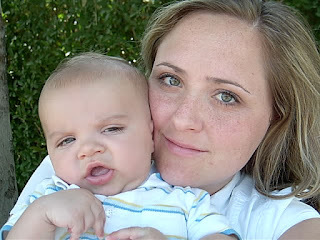 We spent the rest of the day in Idaho Falls at my parents house. Kevin was able to catch a matinee with Ben (he must have a REALLY nice wife) while Owen, Wes, and I stayed at my mom's. 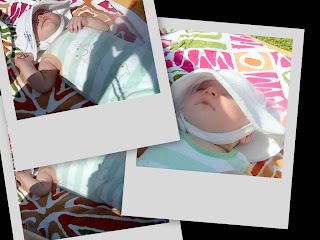 Owen had a great time playing in her little kiddie pool ALL DAY LONG. 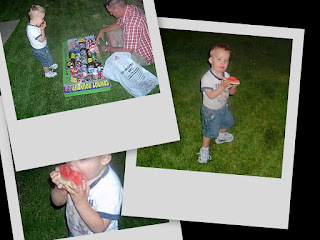 Later that evening my mom put together a great BBQ and the Melaleuca Freedom Celebration (firework show) was even bigger and better than years past. I love fireworks and patriotic music! But, I couldn't help getting a little jealous knowing that my brother Ben, his wife Kaylin, my sister Natalie, and her friend Jamie where in the little plane we could all see circling the sky during the entire firework show thanks to my cousin Jeremy (who had recently got his pilot license and purchased a plane). Luckies! Look at this happy baby! 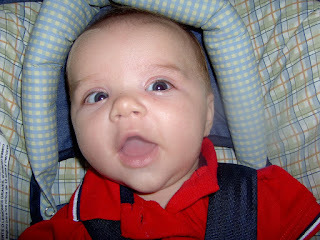 He is growing up too fast. 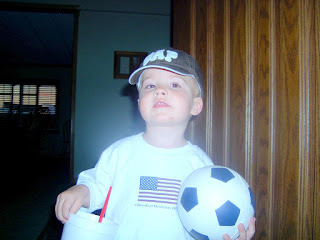 Owen with his hat and ball ready to have some fun with his dad. 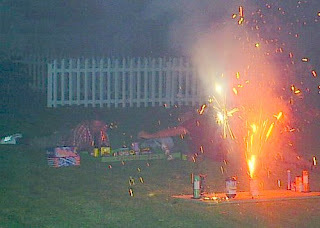 Last night we had our annual fireworks show put on by my brother Ben and brother-in-law Brandon. They do such a great job with these "perfectly legal fireworks" from Wyoming. We always look forward to it! Luckily, my folks live 1/4 of a mile from the fire station...just in case. Owen spent most of the evening with a piece of watermelon in his hand. Who knew he loved watermelon so much? I love the picture of his watching Brandon prepare for the show. 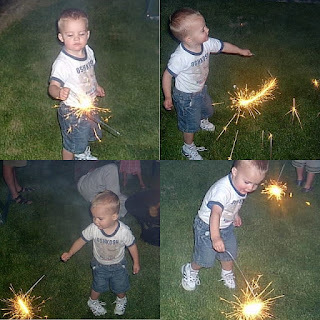 Everyone ran when we put a sparkler in his hand (and for good reason). He was waving it all over the place and having a great time. 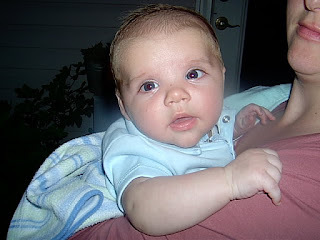 Little Wesley. He was actually pretty good during the show.